Software in the defense sector is more at risk than ever before. New threats, made possible by the emergence and convergence of technologies, have left many defense companies vulnerable to new forms of attacks that were unimaginable only a few years ago. Many of the challenges facing consumer-grade software are slowly being felt by traditional industries that used to rely on other means to deter attacks against their intellectual property or systems. Not only are defense companies forced to deal with unfriendly governments seeking to reverse engineer advanced components and systems. They also face the threats of saboteurs, hackers, customers and sub-contractors intent on making gains by illicit means. Wibu-Systems has been on a mission for 30 years making important advances in the software protection and licensing world that have benefitted multiple sectors of industry. Building on a strong reputation of products that work and have withstood high-profile hacking challenges. Use of standard 256-bit AES, 224-bit ECC and 2048-bit RSA encryption algorithms to encrypt applications for standalone, network, server and cloud deployments. CC EAL5+ and FIPS 140-2 evaluated smart card chips, specifically designed with cryptography in mind. Wibu-Systems also offers a software-based alternative called CmActLicense. 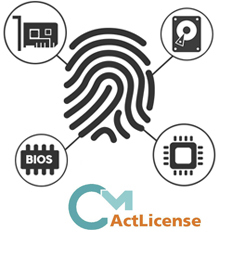 Upon activation, the CmActLicense is bound to the computer or embedded system. This option does not depend on an external device other than the device on which it is activated. This can be a useful choice when upgrading existing devices in the field without distributing hardware dongles. Both hardware- and software-based solutions also benefit from versatile license delivery management, CodeMeter License Central, that interacts with back-office systems. For the aerospace and defense sector, we support Wind River VxWorks® 6.8, 6.9 and 7.0, and numerous versions of Linux, 32 and 64-bit packages, both RPM and DEB based, Windows Embedded Standard (WES) and Windows Embedded Compact (WEC) and QNX. Additional operating systems include Windows and OS X. There are two primary ways of integrating protection and licensing into an application. Wibu-Systems offers a powerful Protection Suite that encrypts the whole application (or parts of it) easily without compromising on security. We also offer an API with samples in C, C++, C#, Java and other programming languages to facilitate manual integration and additional customizations. The two methods can also be combined to complement and enhance the level of security for the application. Maximum protection incorporating state-of-the-art anti-debugging and anti-reverse engineering technologies. Full encryption of the executable code against reverse engineering. Encryption and decryption of individual parts of your application at runtime. Limited impact on performance regardless of the size and complexity of the parts. Signature of the encrypted application to ensure its code integrity and authenticity. Customization of your status and error messages to reflect your corporate design, or possibility to run the software hidden in the background without any visible user interface. CodeMeter dongles are available in form factors designed for Embedded Devices: µSD Card, SD Card, CF Card, CFast Card, or ASIC and internal USB for PCBs. CodeMeter dongles (USB) use HID as communication protocol. No additional kernel driver is needed. The firmware of CodeMeter dongles is signed and uses secure boot. BadUSB is not possible with CodeMeter devices. Code-based activation can be used. Only a fingerprint needs to be transferred via a phone line. A push update for CmDongles allows updating licenses in the red zone. Software is delivered in many forms and formats, which is why we employ a range of form factors that are standard in many industries. Whether you deliver software only or a combination of software and specialized hardware, the versatile form factors offered by Wibu-Systems will make deploying your product much easier.